BBQ and Guns | OhGizmo! By pjchapman on 07/28/05 • Leave a comment! At first it took me a second to realize what was novel about a giant gun shaped barbecue pit. Then I realized the rest of the world wasn’t raised in Georgia where this wouldn’t even elicit a second look. 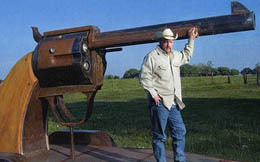 An ambitious Texan, by the name of Joe Wood, built this beauty. It stands at 6’11” and is over 15 feet long. The pit is fully operational (I’m above making a Star Wars joke here) and weighs in at about 2 tons of wood and steel. Joe spent two years on the Gun-B-Q and about 1100 hours. This guy has “case-modder” written all over him. Idle hands are the Devil’s tools. The Devil is really pissed at Joe.